Boasting the title of '5th most expensive postcode in London', St John's Wood is a truly luxurious and opulent district, which houses far too many notable residents to mention. Among a range of lavish and heritage rich dwellings, in 2013 the coveted Avenue Road had 10 villas for sale with the most expensive at £65 million, and the cheapest offering at £15 million. This very affluent neighbourhood is also home Abbey Road, where a daily throng of Beatles fans flock to the iconic zebra crossing to take pictures, as well as disturb and generally hold up the flow of traffic. It is here that today we take a trip to the quieter, yet no less impressive, Carlton Hill. 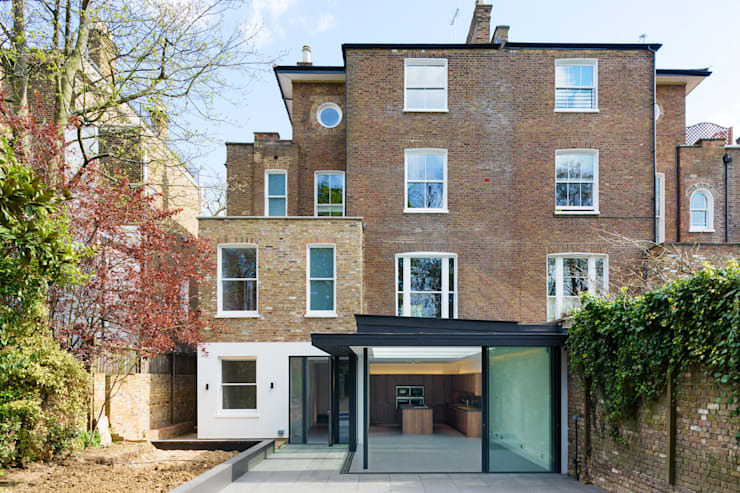 This gorgeous 400m2, 19th century townhouse has undergone a complete transformation, and is now a stylish and liveable modern London residence. 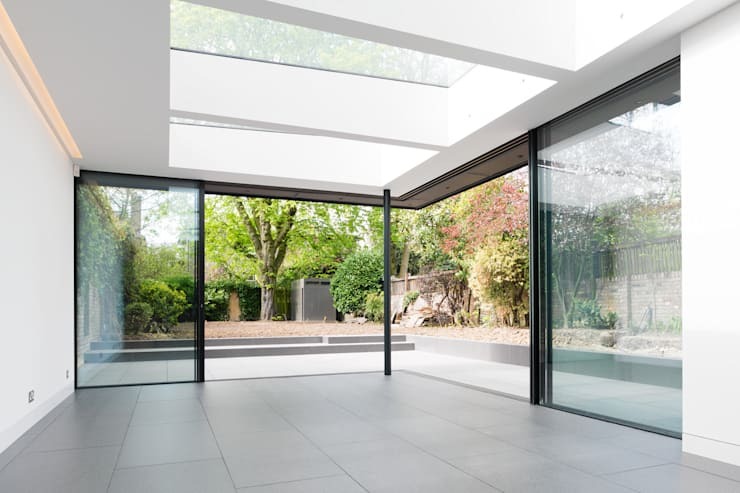 Brought to life by Gregory Phillips Architects, the abode now contains a new glass extension with large sliding doors that enter the garden, while a second floor bedroom has been added. To top off this unbelievable modification, the interior has been totally refurbished. Along with the more obvious improvements, energy saving upgrades have been incorporated, which reduce the home's overall impact on the environment. The exterior of the home indicates some drastic changes to the dwelling. 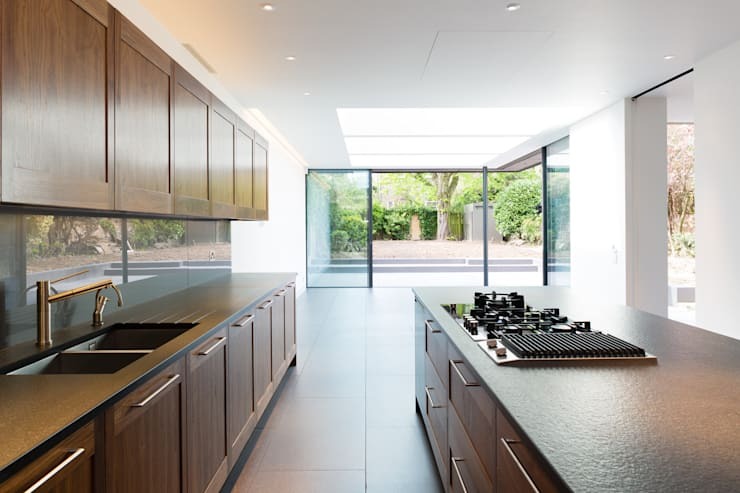 A glazed rear extension provides space for the new kitchen, dining, and living room. Additionally, a two storey bedroom duplex has been built to the left of the glazed section, and offers private sleeping quarters that are both tranquil and separated from the existing building. Although this home is not yet furnished with an array of gorgeous decorative pieces, it is still an enviable home that boasts abundant living space, and high quality finishes. The exterior garden has a new entertaining area, with grey tiling to provide cohesion with the interior, and a place to host a stylish event. Moreover, rainwater is harvested for garden irrigation, improving the sustainability and eco-friendliness of the home. 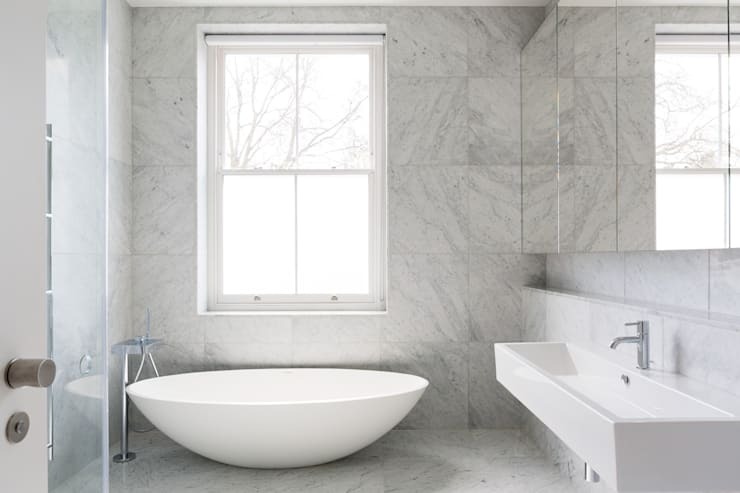 Moving next into the newly refurbished bathroom, we are blown away by the beauty and magnificence of the floor to ceiling Carrara marble. Lately, bathrooms have tended to become perfunctory spaces. We often live in more compact homes, and therefore, the luxury and opulence of a lavish bathroom is low on the list of domestic priorities. However, here in this room we are treated to a wonderful return to extravagance. From this vantage we are given a glimpse of the free-standing bathtub, which takes centre stage underneath the double-hung sash window. Minimalism is employed in many areas of this home, but quite evident within this wash space. A long and large sink is flanked by mirrored wall-mounted cupboards, and functions simply and effortlessly within the room. Wow! The interior is both surprising and delightful. 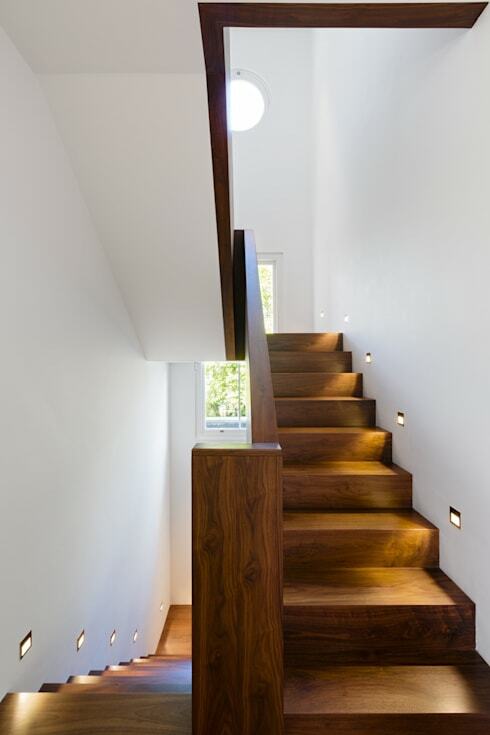 American black walnut timber veneer has been utilised for the staircase surround, and matches the steps, as well as the floor. The colour contrasts beautifully against the crisp white colour scheme, and the room is wonderfully illuminated with integrated lighting set into the wall on every second stair. The staircase appears to float within its space, imparting many different shapes and forms that add to the overall architectural aesthetic. 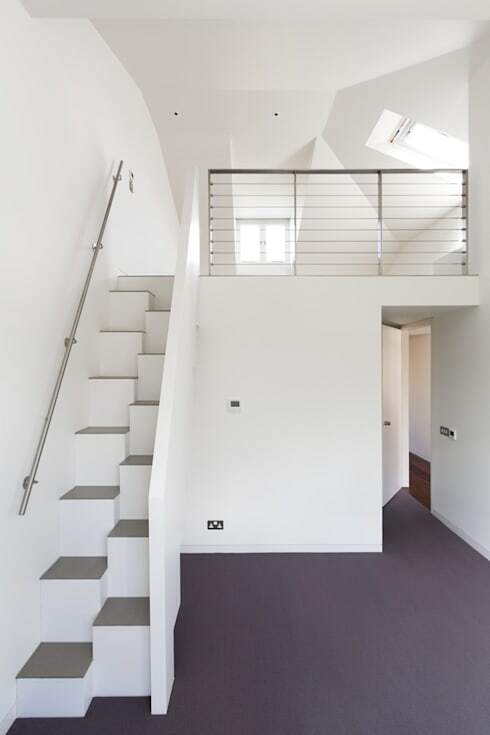 Within the private new bedroom area we see a multi-level space that maximises its functionality with a mezzanine. The room is ideal for guests or teenagers, as well as young adults who require a little separation from the main house. The room contains automatic blinds, ensuring the bedroom is light during the day, and sumptuously dark during the night. During the upgrade the entire house was upgrades with many eco-friendly enhancements. Underfloor heating has been installed, and all of the external walls have been insulated to reduce thermal loss within the home. Finally, within this space the colour scheme is a consistent white hue, with a contrasting aubergine floor that adds style and grace to the overall design. What a view! This perspective allows the occupant a great outlook to the garden beyond, as well creating light for those using the kitchen. The room is gigantic, with colossal living spaces that allow the individual to utilise the area for many different purposes. Once the kitchen island has had some bar stools added, the occupants will be able to use the enormous gas hob for cooking delicious meals. A true chef's kitchen, the island is on display for all those who want to watch the magic unfold! Peeking from the other direction we see the corner L-shaped kitchen that is both mammoth in its size and its appeal. 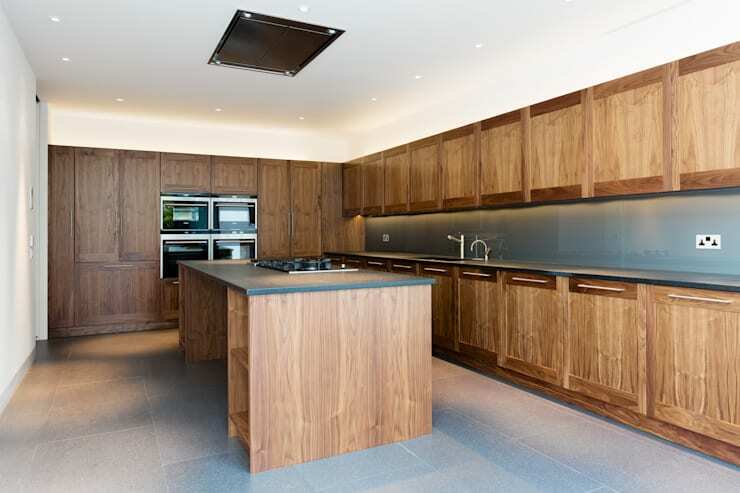 Timber veneer is continued throughout the home, and finished in the cooking space with this bespoke joinery. A kitchen island adds vital preparation room, while there is more than enough storage for even the largest of families. The splash-back reflects the flooring, and imparts functionality to the room, without sacrificing style or elegance. Underfloor heating supplies the room with warmth, and a hidden (almost invisible) exhaust fan sits stealthily within the ceiling space. An ultra-impressive space, we love this room and its gorgeously timeless modernity. As the final image before ending our tour of this extravagant and gorgeous abode, we take a closer look at the new glazed rear extension. One of the best elements with the new construction is the way the architects have maximised light to create a naturally illuminated expansive domestic space. Huge glazed roof lights bring an abundance of sunlight into the space, as well as providing a gorgeous night sky for those residing within the living quarters. Another stylish feature of this area are the large sliding glass doors that can be opened to create an inside/outside entertaining and living room. Would you like to live in this gorgeously refurbished townhouse? Let us know in the comments below!